Far away from everything, staff are lazy and irresponsible, the room is generally clean only. Get what you pay for. The property I stayed in C813 was very dated, the bathroom was always flooded due to the design of the place and there were marks all over almost every wall within the place. Nothing a coat of paint couldn’t fix. 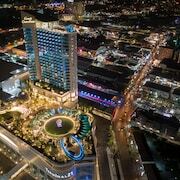 There are plenty of places to stay in Pattaya with 2163 hotels and other lodging options to choose from, including 128 apartments. Why not enjoy the treasured shops and amazing beaches in this romantic area? Three Kingdoms Park and Wat Yan Temple are top attractions to visit. Are you thinking about an apartment instead of a traditional hotel? Apartments are ideal for families who want the conveniences of home, and also for couples looking for something with a more local feel. Though weather is just one aspect, it can really affect your travel plans, especially when planning a longer stay. And since apartments often have more stringent cancellation policies, it's good to understand these weather averages before you book. Pattaya is well regarded for its beaches and shops. Cultural attractions include Anek Kuson Sala and Tuxedo Magic Theatre, whereas Three Kingdoms Park and Pattaya Beach are a couple of picturesque spots to enjoy the outdoors. You can also visit some other popular places in town including Wat Yan Temple and Buddha Mountain.